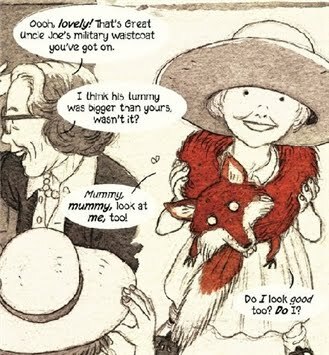 Dotter of Her Father’s Eyes, written by Mary Talbot and illustrated by her husband Bryan Talbot, combines two coming of age stories set decades apart. One is a memoir of the author’s upbringing and of her troubled relationship with her father, renowned Joycean scholar James S. Atherton (using Joyce’s own words, she thinks of him as her “feary father”); the other is a biography of James Joyce’s own daughter, Lucia. The two stories are seamlessly interwoven in a structure that draws attention to the parallels in these two women’s lives and highlights the book’s overall themes. Mary Talbot grew up in Wigan, Northwest England, in the 1950’s and 60’s; Lucia Joyce lived, and discovered her talent for dancing, in bohemian 1920’s Paris. Their stories unfolded worlds apart, and in many ways are very different. Yet both were talented young women growing up in the shadow of intimidating fathers, who were widely acclaimed for their genius but whose attitude towards their daughters’ individuality and career ambitions left something to be desired. 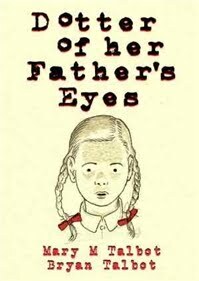 Troubled father-daughter relationships play a key role in Dotter of Her Father’s Eyes, as do attitudes towards women. Mary’s and Lucia’s paths are both affected by the straitjacket of gender expectations. The decades that separate them mean that these don’t take the exact same shape, but the parallels are nevertheless many. Entering school introduces Mary to the rigid gender roles of the 1950’s, which include complete segregation for most activities. Lucia’s bohemian environment, on the other hand, was seemingly more flexible, but her very traditional mother disapproved of her ambitions as a dancer, and even her modern father believed that as a woman she should be content to “carry an umbrella gracefully” and “know how to walk into a room properly”. As Mary Talbot says in this interview, the structure of the book gave her room to “explore aspects of social history – gender politics and social expectations, shifting attitudes about ‘proper’ behaviour – in a very concrete way that hopefully makes these abstractions come alive.” As a reader I get to remove that “hopefully”: this is exactly what it does, and very well indeed. If there’s as aspect in which these two women’s stories differ greatly, it’s fortunately their conclusion. Mary went on to become a successful academic, whereas Lucia ended her days in a mental institution. One is a story of survival, the other a story of collapse. However, Mary’s triumph only highlights the sadness of Lucia’s breakdown. There is so little that separates them – time, the loosening of social mores, a person there at the right moment, and a respite from sexism and the infantilisation of women. Dotter of Her Father’s Eyes is the exact kind of book I love – an acute analysis of the impact of rigid gender roles in two women’s lives, and also a memoir of intellectual and emotional growth, full of references to books and to the cultural markers of the author’s life. Furthermore, it does a great job of combining social history and a more personal angle. The section about Lucia Joyce conveys some of the charm we tend to associate with 1920’s Paris and its literary life, but it does so while revealing its dark side, particularly for women who lived in the shadow of great men. As you can see from the images I included, Bryan Talbot’s art is as wonderful as always. 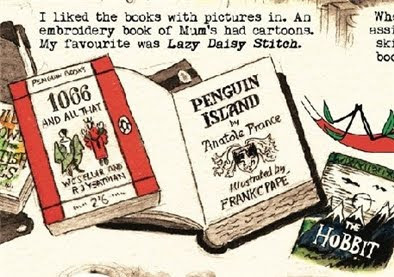 He uses different art styles for the alternating sections – colour for the present day, sepia for Mary’s past, and tones of blues (my favourite of the three styles) for Lucia Joyce’s story. This approach makes the temporal transitions smoother and helps highlight each section’s different feel. 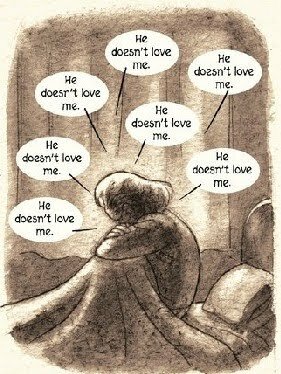 Dotter of Her Father’s Eyes was one of my most anticipated releases of the year: not only do I love Bryan Talbot’s art, but I have encountered and been impressed by Mary Talbot’s academic work on gender and linguistics in the past. As you might have gathered by now, I wasn’t disappointed in the least. The way I described the book might have reminded some readers of Alison Bechdel’s brilliant Fun Home, and it’s very telling to say that Dotter of Her Father’s Eyes doesn’t really suffer in the comparison. Reading this book made me want to learn more about Lucia Joyce, so I was delighted to see that a reading list was included at the end. Some of the books listed are Lucia Joyce: To Dance in the Wake by Carol Loeb Shloss, Sylvia Beach and the Lost Generation: A History of Literary Paris in the Twenties and Thirties by Meyer Howard Fitch, and a biography of Nora Joyce by Brenda Maddox. I loved Maddox’s biography of Rosalind Franklin and would love to read her take on James Joyce’s wife. Dotter of Her Father’s Eyes will be out next Thursday, the 2nd of February, to coincide with James Joyce’s 130th birthday and the 90th anniversary of the publication of Ulysses. 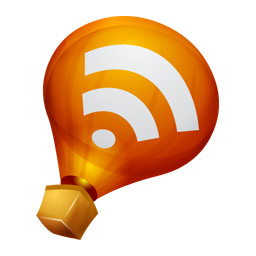 Affiliates disclosure: if you buy a book through one of my affiliates links I will get 5%. I downloaded a copy of this book via NetGalley. This sounds wonderful. The title is so quintessentially Joycean! I might have to eschew my usual aversion to graphic novels and pick this one up! On to the wishlist it goes. After your first paragraphs The Unwritten came to mind. Did you also think about it at some point? 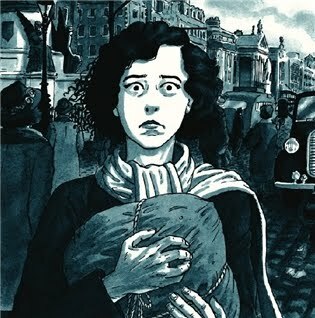 Another great graphic novel to add to the list. This one looks great! This book sounds so interesting, not only for the shared perspective about two different, yet very similar father/daughter relationships, but because the illustrations also really entice me. I need to see if I can find this one locally. It seems like a great book, and your review was wonderful! 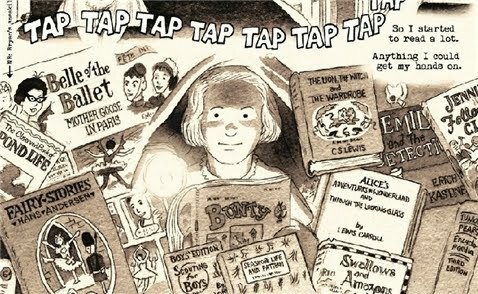 Alex: Hmmm, I can't say it did, but there IS a connection that Bryan Talbot has done illustrations for The Unwritten. Melissa: I hope you enjoy it as much as I did! Zibilee: I hope you find it! And yes, the art is just great. I love Talbot's style. *laughs* Well, its good to be predictable :). Pictures! James Joyce! His awesome daughter! I have this waiting to be read from Netgalley. So glad to hear you enjoyed it. This sounds good but do you think someone would like it who is me and wants to slap James Joyce mmmmmmmmost of the time? I love the art in this one! It sounds excellent. This sounds excellent! I haven't read a graphic novel in almost a year... will keep an eye out for this one. Iris: I can't wait to hear what you think! Heidenkind: Bryan Talbot's style is wonderful, isn't it? JoAnn: If it helps, I've seen this compared to Ethel and Ernest, which I know you loved. I initially requested this from netgalley too but decided not to read it just because life is crazy right now and I requested too many books! I did think of you when I started it, though! I thought, "I think this is a Nymeth book..." sounds like my prediction was right on! Maybe some day I'll get to it.